Author’s note: This blog post is the second in a series called “Diving Deep Into [HR Topic].” In each post we explore a topic beyond just the surface, looking at the trending content, the influencer’s engaged with it and the media outlets covering it. Essential information for marketing and PR folks. The first topic was HR big data. Today we continue with HR technology. We use HRmarketer Insight to do the analysis. HR technology is a big topic that has high engagement, and for an obvious reason: HR technology is directly connected with the future of HR. So what is currently happening in HR technology? What are leading experts talking about in online news stories, blogs and in social conversations? To find out, you can use social conversation analysis software. I searched for HR technology using a three-month time frame in HRmarketer Insight, software that tracks the social conversations, content publishing and content sharing in the human resources marketplace. Below are some of the most-shared articles, and the primary argument in each. Argument: HR practitioners and recruiters need to embrace social and digital technologies, and become more strategic. Argument: In announcing stepping down as founding co-chair of the HR Technology Conference following the October 2013 edition in Las Vegas, Bill Kutik notes the following reasons for the event’s success: the conference filled a need, has had strong programs, his recognition that conferences and trade shows are part of show business, and that it has become a town hall meeting of sorts for those in HR tech. Argument: Newcomer Workday became a major competitor for SAP and Oracle in 2012, and discussions about and coverage of workday dominated the HR technology landscape. In 2013, we will see if Workday can continue its momentum, or if we will be talking about SAP, Oracle, InFor, Ceridian, Microsoft or other companies when it comes to the intersection of HRM and IT. Argument: For all the amazing new HR technologies coming out, HR still often misses the mark in driving business outcomes. HR has worked hard to prove its value to the business, but it focuses “too much on grand programs, rather than focused solutions to business problems — current and future.” Instead, HR practitioners need to be contribute to strategy and be teammates working on solutions to problems, without adding to leaders’ and employees’ workloads. Argument: Dave Ulrich argues that technology proponent is one of the six competencies HR professionals need. In particular, he said high-performing HR professionals are now using social technology to help people in their organizations stay connected with each other and some are increasing their role in the management of information. – Dean Da Costa: A senior recruiter/staffing professional with experience at top companies such as Avanade, Microsoft, DMR and Hewlett-Packard. Engagement on HR technology: Dean regularly tweets articles and blogs about HR technology. – William Tincup: A leading influencer with more than 160,000 Twitter followers, experienced entrepreneur, senior executive and expert in talent management and brand management. Engagement on HR technology: William frequently retweets articles about HR technology. – Sean Charles: A consultant who helps clients engage current and future clients through social media. Engagement on HR technology: Sean regularly tweets HR technology-related content. – Rayanne Thorn: The North American marketing director for Broad Bean Technology, which provides online and social media solutions for major employers, staffing agencies and major employers. She’s also a blogger for Blogging4Jobs. Engagement on HR technology: Rayanne blogs regularly on HR and recruiting technology issues. – Jessica Miller-Merrell: An author, speaker, HR professional and social media expert focused on recruiting, training and social media. Engagement on HR technology: Jessica blogs on HR technology issues, and also posts content on Twitter and Facebook. – Steve Boese: A consultant and new co-chair of the HR Technology Conference. Engagement on HR technology: Steve blogs and tweets regularly about HR technology in addition to taking over from Bill Kutik as HR Tech co-chair. In a matter of about 20 minutes, using HRmarketer Insight, it was easy to learn quite a bit about what’s been happening in HR technology during the last three months. Not surprisingly, much of the online and social conversation was related to the HR Technology Conference, which was held in October, and to Bill Kutik’s announcement that he will step down as founding co-chair of the event. 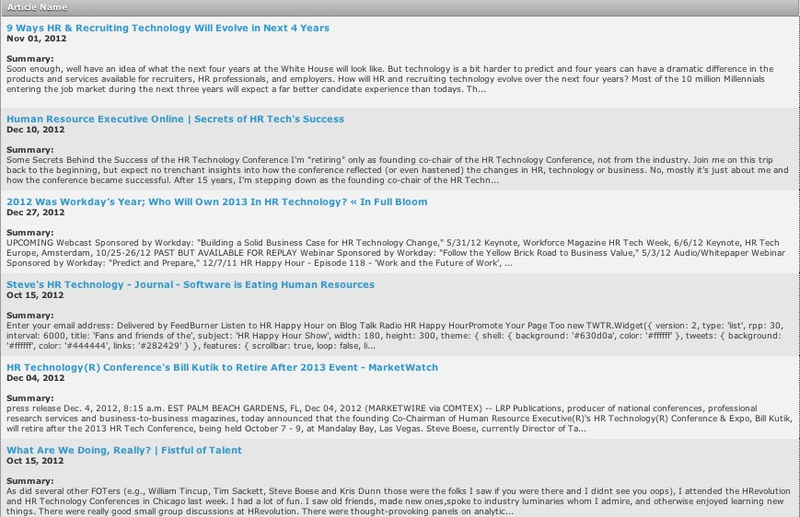 As we progress more into 2013, however, the trending content related to HR technology will surely change. As a result, to stay up-to-date, one needs to at least occasionally — at least every three months or so — repeat the process. And through the same process, it’s easy to learn quickly about any HR-related topic that B2B marketers and PR professional might need to know about for their content marketing, inbound marketing and other marketing and PR initiatives. Post written by HRmarketer / HRmarketer Insight team member Eric Anderson.